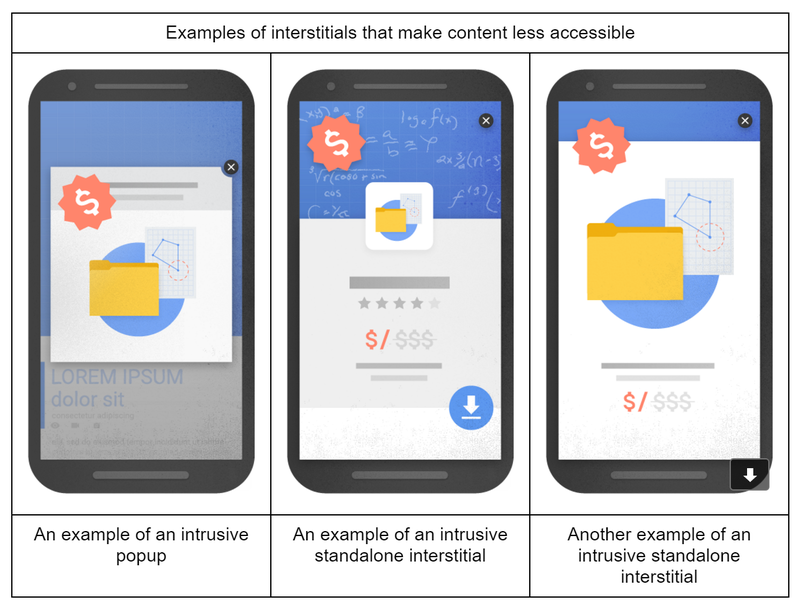 Google is finally making the leap to target sites that are giving searchers a poor user experience by devaluing sites using all kinds of pop-ups and mobile interstitials – including fake interstitials. Starting early next year, Google will not rank pages with intrusive interstitials as highly as those without. And more importantly, this includes pop-ups that trigger either when viewing the search results or while scrolling the page. This is something many searchers have complained. When Google introduced the signal where those pages with app interstitials would lost their mobile friendly tag and boost in the search results, many sites switched over to a “fake interstitial” where instead of the page people were expected, they served what appeared to be an interstitial that lead many to believe that the app was required to view the content, but if they continued to scroll down, the real content would eventually display. This definitely went against the spirit of the app interstitial change. Now, these types of fake app interstitials will no longer rank as highly, starting on January 10, 2017. That is quite a warning period but also means that sites don’t need to worry about it until after the upcoming holiday season. Pop-ups are also targeted. Mobile pop-ups tend to be more obtrusive for searchers since they can be harder to close – and sometimes impossible to close – on mobile. 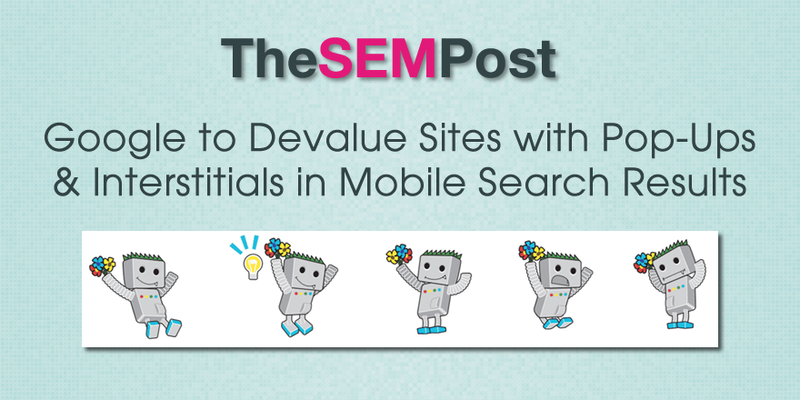 For site owners with pop-ups, this means you will need to serve pop-ups only on the second page view when someone clicks through from the mobile search results. This signal does not affect desktop pop-ups though. But it will make it a bit more inconvenient for those with responsive design who want to use pop-ups on desktop still. Google has made it clear that some types of interstitials, such as for cookies notice and age verification, will not lose ranking due to this change. Instead, they are targeting the types of interstitials that give a bad user experience. For the fake interstitials, Yelp was one of the early adopters of this fake interstitial tactic (a tactic they continue to use) and many other websites followed suit, such as Pinterest. So it will be interesting to watch as these sites change ahead of the deadline. Using banner app installs on a page is still fine. Google has confirmed that user intent is still a strong signal. So even if a page is using an interstitial, Google will continue to rank that page highly if they feel that is the page Google is looking for. So a brand will still rank highly for its brand name, even if using an interstitial. Thanks goodness, thank you Google. Great news. And a big thank you for showing your social share buttons at the Botton of your page instead of sticking them on the side. I actually read your whole article without being followed by share buttons and having to position the text to read in one small space.